The only realistic texture pack at default resolution! Includes (most) blocks, items, armors, mobs, weather, particles, complex biome colors, custom lighting, custom clouds and sky, a stylish, minimalist graphical interface and a few add-ons with optional variations. Realistic colors, subtle shading, seamless tiling, unbelievable detail, everything was designed to make Minecraft look more real without sacrificing its blocky style. This is not your average flat, amateurish 16x pack! Please don't redistribute this pack or release any part of it to the public. If you like something from my pack don't ask me if you can use it but tell me and I will consider releasing it as an add-on pack for anyone to use. You can then suggest people to use my add-on together with your own pack. For example, I released the light maps as a standalone pack, Pixel Reality Luminance. If you want to let people know of this pack do it by posting a link to this this page, so I get credit and downloads. NOTE: you don't need mods to correctly view this pack in game, but if you use Optifine you'll enjoy a much better experience, especially regarding lighting, colors and sky effects. 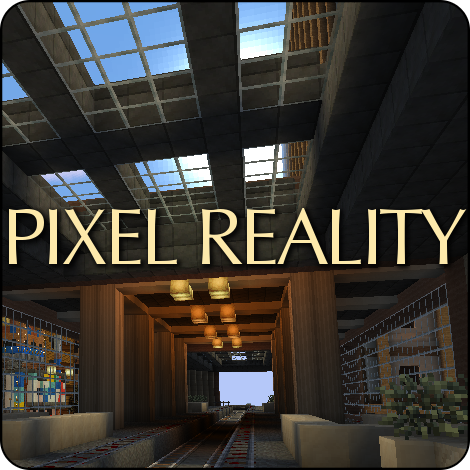 keep them included in Pixel Reality pack (i.e. you get all add-ons with the main pack but you have to unzip it to find them)? Please tell me in the comment section below. Adobe: changes stained hardened clay into pastel tinted adobe-like blocks good for building and pixel art (but bad in the Mesa). Framed Glass: adds a frame to stained glass and makes it slightly more transparent so it looks better for modern buildings. Bright Stone: makes any stone-based block brighter, pretty much as vanilla stone; this includes cobblestone, stone bricks, furnaces, slabs etc. Untamed: turns farm animals into their wild ancestors: buffaloes, red jungle fowls, mountain sheep and boars. Unbound: removes numbers and the letter "F" from the hotbar GUI, useful in case you changed your keybinds or just don't need to see them. Textiles: adds fancy motifs to Wool blocks and Beds. This pack features lighting effects only, all textures stay vanilla. Excellent if you just want a more realistic experience but don't care for different graphics. Includes three versions, from full changes to lightmaps to realistic shadows only. Adds a realistic sky to vanilla or any pack, of any resolution. This pack fully supports and wholeheartedly recommends Dynamic Surroundings mod for enhanced environmental effects. It also supports Undeground Biomes and SchopCraft, but those won't necessarily be updated because I no longer use them. Hey! Love the pack- I've been using it on 1.12.2 lately. Just wanted to let you know there's an error with the sugar cane blocks in-world (pink and black checkered texture) from a misspelling within the "reeds.json" file within /blockstates (change "ereeds_3" to "reeds_3"). Thanks for the feedback, I just uploaded a fix, it should be available in a few hours. I used this on 1.13.2 and for some reason the skeleton horses are invisible. This pack doesn't support 1.13.2 yet, it's a beta made for 1.13-pre1 only. Oh. How soon is it gonna be updated? I could release a compatibility update (no new textures) in a few days. "Compatibility update" as in no textures for the new 1.13 blocks? That's fine. Is this something I can fix or is it a known issue? I should say that I have no idea what I'm doing when it comes to mods and texture packs so I had Twitch/Curse to install everything. Oops, I left some WIP assets by mistake. I just uploaded a new version with a fix and some additional stuff, it should be available in a few hours. Really love the mods by the way :) Although, using more lighting is interesting... Makes it feel a bit more real! Hi, love your packs! Are you planning on updating the Atmospheres to 1.13 as well? Thanks! No need to update PR Atmosphere and PR Luminance, those packs work with any version (except very old ones). It's a resource pack, so it goes in the /resourcepacks folder. The pic is not visibile but I suppose it's about transparency; if that's the case I can't do much because of the way the game handles translucent textures when put one behind the other. I think numbers and letter F should be removed from the slots. They won't match if you change default key binds. Or maybe make it an addon. Otherwise I'm really pleased with the whole Pixel Reality package! I always liked an idea of low fidelity graphics with high attention to details. Thanks. I will consider an addon for removing those.